The first refurbished Class 158 entered into full service this month on the route between Leeds and Lincoln and will soon be followed by more than 240 refurbished trains from across Northern’s fleet, including Class 150, 155 and 319 sets. 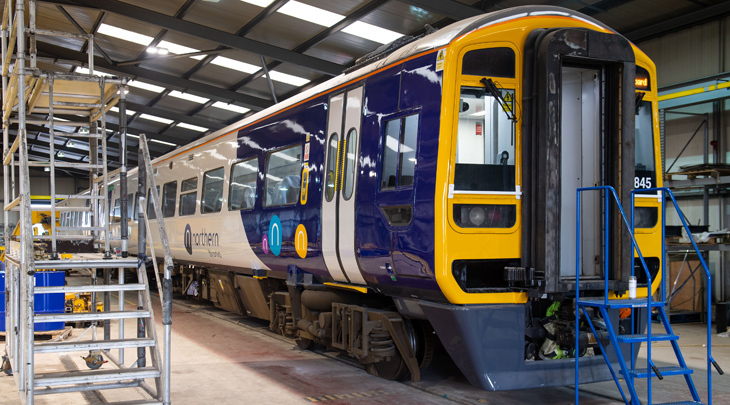 Ricardo has supported Northern’s rolling stock refurbishment programme since 2016, providing system integration services from the concept design stage through to detailed design and installation. To deliver the full scope of works, a multi-disciplinary team was brought together – including rolling stock engineers, human factors specialists and EMC experts – to compile and produce the necessary technical designs and reports. These included initial installation concepts, design risk assessments, electrical schematics and wiring diagrams, as well as final drawings and documentation such as Modification Procedures and Maintenance Bulletins. Ricardo also carried out the approvals process, validating the systems and the design integration. This Ricardo assistance helped ensure the new onboard digital systems – including CCTV, Wi-Fi, Passenger Counting, Passenger Media Information, Forward Facing Cameras and provision for a Driver Advisory System – were integrated into a single Ethernet-based onboard network. This was to help minimize the number of antennae, communications hardware and sub- components, and enable single sign-on to activate the systems. Ricardo’s teams will continue to support Northern’s refurbishment programme, helping to ensure these enhancements are rolled across other vehicles in the fleet – applying adaptations to the designs as necessary – and help the operator deliver an improved service for passengers across the routes it serves.